First, I would like to thank the Africa Book club for bringing this book to my attention.Otherwise, I wouldn’t know about it. It’s funny the other day I was having a chat on twitter with a Ghanaian,who was asking me about the Ghanaian authors I have read. I said not many. Actually, here is the second one. Whenever I read a novel about immigration, I am really excited. Being an “African migrant” myself, I always feel like my very own story is being told. And it feels good! So, you can understand why the story of JoJo Badu was that fascinating to me. It, also, reminds me of Imefelu in Americanah and of Dr Sai in Ghana Must go. Same concept: A particularly bright african who was given a chance to study abroad, and he seized that opportunity to reach the sky. The main difference, between the three novels, is the integration part. You see JoJo Badu had problems getting a job after graduation, even though he graduated from an Ivy League University. On the other hand, Dr Sai in Ghana must go got a job as a doctor after school ( Doctor is the top professions in US/Canada). While Ifemelu in Americanah was totally integrated in the system, a job was never an issue for her, she even quits hers to follow her passion for blogging. Why do you think most African migrants are overachievers? For example, check this author Biography below! I have always wondered. If you got an answer, the comment box below is all yours. Born in Accra, Ghana, Benjamin Kwakye attended the Presbyterian Secondary School (Presec), Dartmouth College and Harvard Law School. At Dartmouth, he majored in Government (with an emphasis in international relations), spending trimesters in Arles, France, and at the London School of Economics and the United Nations Association in New York. He wrote and published poetry while in college, served as editor of Spirit (Dartmouth College’s African-American Society’s literary journal), and received the Society’s 1990 Senior Honor Roll for outstanding leadership, distinguished service and intellectual and artistic creativity. His first novel, The Clothes of Nakedness, was published in 1998 by Heinemann as part of its African Writers Series. It won the 1999 Commonwealth Writers Prize for Best First Book (Africa Region) and has been adapted for radio as a BBC Play of the Week. After the publication of The Clothes of Nakedness, he became Resident Novelist of Window to Africa Radio and Afriscope Radio with Cyril Ibe. His second novel, The Sun By Night (Africa World Press, 2005), won the 2006 Commonwealth Writers Prize for Best Book (Africa Region).His third novel is The Other Crucifix (Ayebia Clarke, 2010), winner of the 2011 IPPY Gold Award for Adult Multicultural Fiction. He is also the author of a collection of three novellas: Eyes of the Slain Woman (Anaphora Literary Press, 2011). 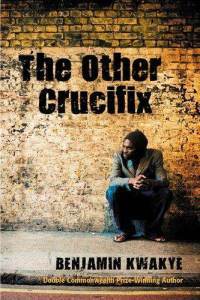 Jojo Badu, the protagonist in the Other Crucifix immerses himself in American college life, a new life that alienates him in more ways than one from his native Africa. As the years pass, memories of Ghana fade until his uncle’s death in a coup d’ état triggers a crucial reawakening. Unity in Blackness: The color of our skin, Black, is what bind us. Or so Jojo Badu thought the first time he arrived in America. To echo, one of his reflection: you expect not to fit with white people, they have a different background, upbringing, social status, values..etc. What is quite shocking is that you don’t fit with African-American either. I never really thought about it, but it makes sense. African-American left Africa 400 years ago, that is several lifetimes. But for some reasons, we expect to feel close to them because of our blackness. Paradox? You see Jojo has an African-American friend, Dwayne. They have this very special relationship: on several occasion, Dwayne felt like Jojo was not supporting his “own people”. Take for instance, the issue of Jojo’s white girlfriend. All African-American on campus were very upset that a “brother” dare have a white girlfriend. They felt that Jojo was insulting every black women on the campus. African or African-American or American: Jojo’s wife, Fiona, spent parts of her life in Ghana, but she is African-American. So she has this very strange connection and love-hate relationship with Ghana. She went to Ghana expecting pretty much the same thing, as Jojo was expecting from African-American, when he went to the US. I am going to live with my people, where we are all black brothers and sisters…Unfortunately, while in Ghana, she was considered an American! I really like this part of the novel. Because we don’t often get to see this side of the coin . Because she spend several years in Ghana, she had acquired a Ghanaian accent. Back to the US, she then became a Ghanaian. Quite a mess! Fresh Immigrant: I enjoy reading about Jojo first time traveling and eating american fast food. However, what is more interesting is Jojo’s feelings toward Ghana when he reaches the US. You see when you left your country the first time, you are homesick. You can’t wait to go back as soon as possible. The plan is to graduated as soon as possible, and, leave by the next available plane on graduation day. Even I felt like that my first year. But unlike Jojo, I was able to go back every summer during my university years. Now, I dream of living between Montreal and Dakar. Haven’t figure out a way to do it yet. I will stop right there, this is one of my favourite topic, I could go on and on about it. I recommend you this book. I did enjoy it. And I hope you will.